American campaigns are no stranger to falsehood, lies, and character attacks. That has been going on since the days of Washington and the rocky birth of our remarkable Democratic experiment. However that does not make the practice appealing, and clearly in the current campaign it has been the McCain campaign that has gone the farthest to bring up irrelevant nonsense and distort the truth. Following up on many of the right wing claims about Obama has been an exercise in frustration and shoddy thinking by Obama detractors. This has taken the form of crazy nonsense like the notion Obama was born in Kenya to juxtaposing Obama quotes to make a very reasonable statement seem unreasonable. two years ago, had called for removing moderates from the Senate. Incredibly the writer had simply taken something Obama said should NOT be done in the interest of moderate approaches and then lifted the words in such as way to make it appear to state opposite. These cases of blog fraud or incomprehensibly stupid lack of reading comprehension would not be so bad if they were not immediately picked up by other sites and presented as "fact" along with the misquotes or lies. Even mainstream media "fact checking" is often very questionable. The latest "guilt by association" play suggests Obama is pals with a Palestinian activist named Khalidi, now a professor and consultant. One of the challenges in this case is that a John McCain board gave a Khalidi consultancy over $450,000 for projects polling in the middle east. Most of McCain's campaign has tried to rely on painfully weak connections to figures that mainstream Americans find objectionable in one way or another. Thankfully that strategy appears to have failed - and perhaps we can hope this is because we as voters have become more reasonable rather than simply because the McCain campaign failed to make the smears stick. All the smears have happened within a context of an arguably very unqualified Republican VP nominee hit with abuse of power charges *during the campaign* and McCain's very challenged personal history. The Obama campaign has chose not to focus on the personalities and character of the opposition, and stayed squarely on message in a near-flawless and mostly positive campaign. Will this approach succeed? If so, can we expect future campaigns to take a higher road than in the past? Pundits are wondering if Obama pulled in a few more voters with tonight's 30 minute five million dollar multi-network commercial extravaganza. I think that was only a small part of their objective as they probably only gained a point or so across the board and gaining votes is near-meaningless in California, New York, and most of the heavily populated states (and expensive media markets) that are already lined up for Obama in terms of electoral votes - the only votes that matter in the big show. However this was yet another master stroke of the nearly flawless Obama campaign. Why? It runs out the clock for two full days with only 6 days until the main election day, and with many people voting over the next few days in early voting areas. Obama does not need votes now - he needs to simply maintain his sizable lead. The status quo is Obama's friend and this piece helps to maintain that for him in addition to address, in a very stylish fashion, key concerns of key groups he needs. As with most of the Axlerod innovations this was brilliant and another reason the Obama campaign is likely to go down as *the best run big campaign* in American political history. A flurry of stories and accusations have raised a lot of suspicion about vote counts, especially in Ohio and Florida in the 2004 presidential election. However I remain concerned by reports of defects in Diebold voting machines and optical scanner voting results that appeared to favor George Bush in 2004 by margins that are very hard to explain without invoking fraud. Without a doubt our elections process is flawed so seriously that outcomes were certainly affected in the 2000 election where Gore would have won Florida without ballot errors, though I do not think this was due to conspiratorial activity unless you count the aggressive vote purging efforts of Katherine Harris and other Secretaries of state as a conspiracy. These suppression activities are probably legal in the narrow sense, though I think vote suppression efforts appear to have become a strategic part of many campaigns and this probably should be considered a somewhat nuanced violation of voting rights laws. Suppression efforts generally seem to hide behind the notion of preventing votes by felons and vote fraud, but I think that in general the true purpose is to alter outcomes in a partisan way. Unless modern polling is pretty much a garbage science (it's not), the election appears to be wrapping up with Obama in a commanding lead and McCain poised for a defeat that will pull many states out of the proverbial "red" column. Here in Oregon Jeff Merkley is poised to wrestle away the seat of our excellent moderate Senator Gordon Smith. The campaign has been nasty and expensive and although Smith is well funded Merkley now has the help of national funding that will - in my opinion - give him the election, probably more on the basis of negative ads about Smith than platform issues. Perhaps as importantly, the financial troubles of the country and perceived foreign policy failures of the Bush administration appear to be taking the country towards a House and Senate that are so strongly controlled by the Democrats many policies will face low levels of opposition. This is likely to prove a mixed blessing unless the Democrats use this power with greater wisdom than either party has in the past. As the country and the world teeters on the brink of a potential depression the likes of which the world has not seen since the great Depression of the 1930s we can only hope that the new administration and congress will prove to be the most innovative and successful American political experiment of modern times. Anything short of that .... could be trouble. You know your campaign is in big trouble when the candidate says he may not even attend his election night party. Meanwhile Obama's team is preparing a huge stadium for what polls suggest will be a huge election night acceptance speech by Obama. McCain is now outspent by over 3 to 1, losing in every poll, and appears to be on the verge of a campaign meltdown as they concede state after state to Obama. Pennsylvania may be McCain's sort of "hail mary pass" where they hope to turn the state red and shift the 21 electoral votes to McCain. Even this won't work unless McCain also picks up other states in which he currently trails such as Ohio and Indiana. "The Bradley Effect", where polled people tend to vote differently than they tell the pollsters due to race, seems unlikely to play a role although some think this may work against Obama in the final tallies. Clearly the most important factor at this late time is the mother's milk of American politics....money. Obama's campaign raised a jaw-dropping 150 million in September and will be able to outspend McCain by something like 3 to 1. This is a huge advantage and makes it much harder for McCain to "raise his voice" and profile in the public eye at this critical time. ACORN registration fraud is at the individual level, where workers are padding their registration piles with fake registrations to make more money. No signs that the fake registrants would actually be voting in the election. FOX is very conspicuously failing to talk about this, though I'd guess somebody will find a small number of ACORN people who had plans to go and try to vote based on the fake registrations. It is possible, but I think unlikely, that there is a conspiracy on the part of ACORN to conduct a large scale vote fraud campaign based on the fake registrations. The evidence does not support this at all. For example "Mickey Mouse" mass duplicated names, and pro football name registrants are going to get scrutinized at the polling places and likely rejected. Far more significant in terms of affect are the voter suppression campaigns where secretaries of state are removing huge numbers of names from the registration rolls. Often this appears to be a legitimate attempt to clean ineligible voters from the rolls but in some cases such as Ohio 2004 it appeared to be a very calculated approach to change outcomes. This year Ohio's voting process is under the control of the Democrats and it appears they are working too hard in the opposite direction - effectively having too few checks on the registration process. The system failed in 2000, and Democracy is still reeling from our inability to qualify voters and count votes properly. Partisans who are more interested in outcomes that the Democratic process should bow their heads in deep shame (warning: do not hold your breath on this). The inane stupidity of the "Joe the Plumber" discussion tells us a lot about how out of touch the media is with America. As a "Joe" myself, I'm in a better position to understand Joe the Plumber than, say, Lou Dobbs. My take is that neither left nor right wing media understands why Joe the Plumber is relevant to the current debate, which is simply because he is representative of many middle income Americans who make about 40-80k per year, would actually benefit in the short term from Obama's tax plans, but don't share Obama's sensibilities about how to run country or the idea that deficit spending is a good idea. First, Joe does not even come close to making 250k. No plumbers make 250k. Some plumbing *businesses* with several workers might make that in, although many are mom and pops making far less. Lou Dobbs and some McCain folks have *idiotically* asserted that the issue is about Plumbers when it's about small businesses, most of which do not make 250k. Joe is not a small business - in fact he's not even a plumber. He was (probably wrongly) thinking that if he bought the plumbing place he worked for he'd have trouble paying Obama's taxes, and Obama foolishly just assumed that was true. Unless this is a pretty good sized plumbing business and Joe is a heck of a good businessman it is very unlikely he'll pull in 250k taxable income. Do the math! There are 2000 working hours in a year. Factoring in travel time and such, most plumbers are not going to work that many hours but even assuming they do they'd need to make on average $125 per hour to bring their annual take up to 250k. $125 per hour? Maybe in New York CIty but most places charge far less. But wait there's more.... that's just revenues. You get to deduct expenses, so even if Joe is the best paying guy AND the best business guy AND has several plumbers all pulling in 250k annually for him after he pays them and deducts expenses he'll likely fall where most small businesses fall - under the Obama threshold for tax benefits. But wait.... that does NOT suggest he should vote for Obama. If he's strongly anti-abortion, or really big on gun rights, or wants military spending to be a huge priority he should probably go with McCain. If he hates Democratic control of politics he should vote Republican. So, there are plenty of reasons Joe the Plumber might want to vote for McCain. Taxes, however, are quite ironically not one of those reasons. Colin Powell appears ready to endorse a candidate and it's likely he'll pick Barack Obama in what may be a bit of a coup de grace to McCain's flailing campaign. Although it's possible Powell will endorse John McCain this is unlikely since Powell remains a key player in global affairs and he'd be throwing that away for at least the next 4 years with a McCain endorsement. As a moderate Republican Powell's credibility remains high and he's likely to sway at least some of the type of moderate middle class voters Obama would benefit from. Yes, Obama was born in the USA. 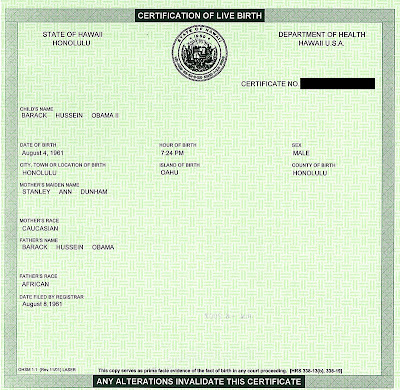 Here's the birth certificate issued by Hawaii. Note at the bottom that this is considered "primae facie" evidence in any court of law. Here is even more detail (including the Certificate number which was blacked out in this copy)* for those of you gullible enough to believe Jerome Corsi is not manipulating the evidence to smear Obama unfairly, which seems to be his main objective with the book "ObamaNation". President Picker endorses Barack Obama for President. Like Christopher Buckley I'm a small government low tax fiscal conservative, but also like Buckley I think the country right now needs - desparately - a "first class mind" in the oval office. The world faces the greatest fiscal crisis since the great depression, and global terrorism remains a critical threat around the world. Obama, unlike any other prominent American leader, will send a signal to the world that the USA remains both the shining beacon of prosperity we have always been but also is asserting an entirely new approach to internal affairs - an approach characterized by flexibility, compassion, and intelligent reflection rather than the knee jerk ideological responses that have compromised our reputation and standing in the global community for the past 6 years. Obama appears to be the right man for these challenging times. I hope that the economic challenges will force Obama into more realistic ideas about how the economy and personal responsibility need to be part of the big equation, while the country will benefit from Obama's ability to galvanize support and bring people together. The future is uncertain and potentially very perilous. Major changes are in order, and Barack Obama is the person America needs right now. On CNN tonight Ed Rollins said it's over and Obama has won. He suggested that the tidal wave of bad economic news means McCain no longer has much if any chance at winning, and the issue is whether the Republicans will lose so many seats their influence in congress is demolished. Rollins is one of the master modern political strategists and a key architect of the Reagan rise to power. He's also much less of a spinner when he'd being a pundit on the many political shows that talk to him. Tonight's debate reviewed much of the same ground in the same way, with little new information from either candidate. The town hall format didn't seem to change the talking points all that much from campaign speeches. Without anything like a knockout, let alone a likely "win", McCain remains in serious trouble because he's losing in many of the close states and needs to make major campaign progress within weeks to have even a shot at winning the big prize. I'd predict most undecided debate viewers will give the debate, narrowly, to Obama. CNN results will be in soon. If tonight's performance is any indication of the final month of the campaign we are looking at an Obama win. Frankly I've been amazed at how little dirty smear campaigning there has been in the campaign so far, but it looks like that may be about to change as new ads and FOX news are really harping on a fairly insignificant connection between Obama and Chicago radical William Ayers. Ayers is now a professor but in the 1960s he and his current wife were founding member of the violent "Weather Underground". They served prison time for terror activities. The New York Times has an excellent summary of the situation. The challenge to a clear thinker in cases like this is fairly simple and involves a few key questions, none of which have to do with whether somebody met somebody, had coffee with them, talked with them, etc. Guilt by association is often an effective tactic but it's not a legitimate reason to be concerned, and it appears that's all there is to this story. Did Obama support Ayers' activities? No, Obama was 8 years old. Does he support Ayers' past activities now? No, nothing in Obama's record or statements or activites suggests he does, and he has stated he does not. Has Ayers had anything that could be a significant influence on Obama's thinking? Clearly not in terms of Ayers past activities. Probably somewhat influential in terms of Ayers educational reform activities, which appear to be of a strictly non-violent nature. The idea that a virtuous person must immediately disassociate himself from any objectionable people and ignore everything they do or say is preposterous. On the contrary, virtue and wisdom *require* these types of interactions. Obama's very liberal voting record is legitimate territory for intelligent debate. Obama's minor association with Ayers....is not. 70 million people watched the VP Debate last night between Biden and Palin, I think making that debate the most watched event of the current election. Only about 50 million watched Obama and McCain in their first matchup and I have a hunch the next two will be about the same. The Palin Biden debate ends pretty much as a tie, with Sarah Palin surprisingly holding her own against a far more experienced politician. Palin's answers seemed well rehearsed, and it appeared her strategy was to have several good rehearsed answers and several good bridges to those topics. When Palin was spontaneous she seemed "off", but when rehearsed she'll be seen as spot on by her supporters. CNN's trend meter indicated good marks for both, though it seemed to me Biden was pulling better with the Ohio undecided women who they measured moment to moment. Overall affect on polls? I'm guessing not much. Palin will appeal to those who like her but this won't change many votes. Tonight's Vice Presidential Debate promises to be one of the most if not the most interesting event of the entire Presidential Campaign. Even with expectations for a Palin "knockout" near zero, Palin may sink the Republican ship without a solid performance tonight. The media is clearly angry at the McCain campaign's unprecedented protection and management of Palin media interactions but much of that media concern will prove justified in the eyes of many Americans if Palin can't hold her own in this format. I almost - but not quite - feel bad for suggesting Gwen Ifill should have offered to step aside because conservatives are making so much foolishness out of what will almost certainly be an objective and unbiased approach by Ifill. That said it's absurd to suggest that she has no stake in the outcome. She does and the Jan 20 publication date proves this. As usual the criticisms by each side are in part correct and the defenses are generally weak. PBS's VP Debate moderator Gwen Ifill's upcoming book about the rise of African American politics in the "Age of Obama" is raising some eyebrows as she'll be moderating the debate between Sarah Palin and Joe Biden tommorrow night. As Brit Hume correctly noted today there is little reason to think she won't be objective but it is of some concern that the book, set to release on *inauguration day* means that Ifill has a significant financial stake in the outcome of the election (ie her perspective if Obama wins is far, far more valuable than if he loses). With journalistic objectivity pretty much in a death spiral already, I think PBS should be getting *out* of the game of partisan journalism rather than finding themselves squarely in the eye of that storm. Given that Gwen just broke her ankle she's got a great excuse to pass her debate duties along to another and she probably should do that. Unless the McCain campaign had been briefed about her book when they agreed to have Ifill moderate the debate it's not reasonable for her to claim this should be of no concern at this time, especially given the publication date which clearly presages the outcome of the election. Ifill is involved in predicting and profiting from the outcome of this election and therefore should offer to excuse herself from the debate. FYI Ms. Ifill - McCain will tell you to go ahead anyway, so why not take the high road here?